It’s fair to say Gadora has been living as a vagabond, albeit a fairly glamorous one, for the last few years. The BFF graciously took me in a little under 2 years ago and her generosity since has been monumental. We have such an exceptional time together, she and I in our adventures, laughing our way through this thing called life. As a result of being slightly disheveled, and in the hopes of securing my next best nest, I’m as slow to unpack here as I have been in the last few spots I’ve hung my temporary hat (a finely crafted fedora is actually a hair more accurate). In the process, it turns out, I can live without quite a lot. 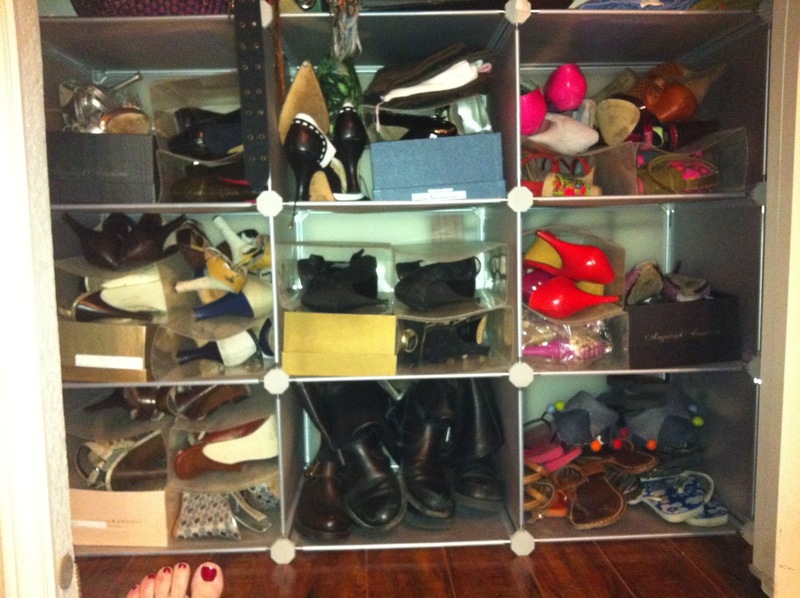 The ONE thing I’ve been sure to cart around are my… shoes. Upon moving in, I took over what was then the office. She let me rearrange furniture and call the space my own. We’ve been peas in a cozy pod until this week’s acquisition of fuchsia Hello Kitty skimmers (below) prompted a reorganization of my entire collection of shoes: reds with same, dressy metallics on the left, black pumps grouped together, flops and sneakers to the right just out of frame and boots (not pictured) paired toe-to-toe and heel-to-heel along the top shelf of my closet. I. Seriously. Love. Shoes. I’ve still not dragged home all of my shoes from my parents’ place, but have managed to fashion my closet after the one I so loved in Park Slope. My former decade in the shoe-biz still provides some of my most heartfelt connections and memories—ones for which I am eternally grateful—and allowed me to amass a rather covetable shoe collection. While the last two years hampered Gadora from adding crisp and fancy footwear to my current library, I’ve had a marvelous time getting back to my boots, errr… roots while hunting for vintage shoes. 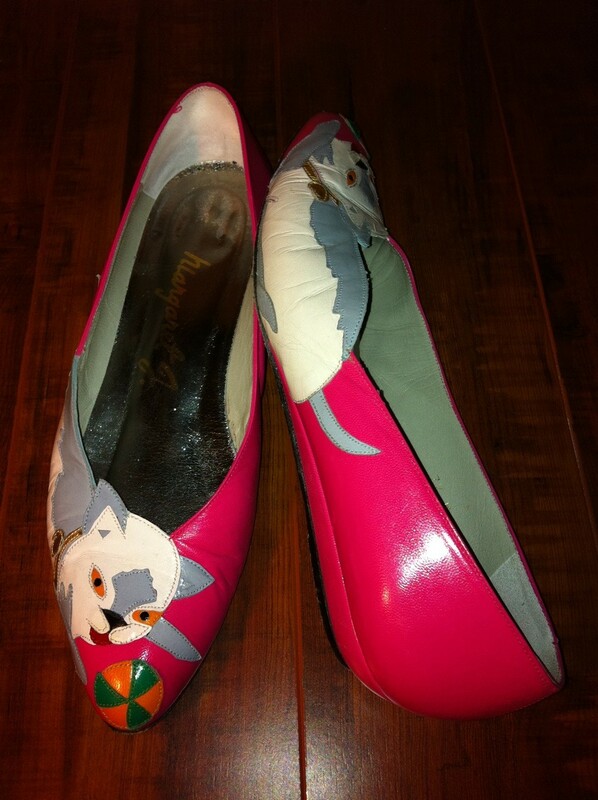 Hello Kitty skimmers by Margaret J. Over the weekend the BFF and I jaunted off to Goodwill for a few Halloween costume ideas, where I returned practically empty-handed… armed with nothing more than a new pair of (old) shoes. Hello Kitty! Ok, they’re not really Hello Kitty, but they boast a kitten, sporting a gold collar, playing with a ball. How cool are they? And besides, I miss mine immensely (see yesterday’s post). They are utterly ridiculous—and that makes them entirely fabulous. Turns out I’m a sucker for a vintage shoe, freals, and while the kitten demi-wedges are darling, I’m unapologetically drawn to shapes with peep-toes. 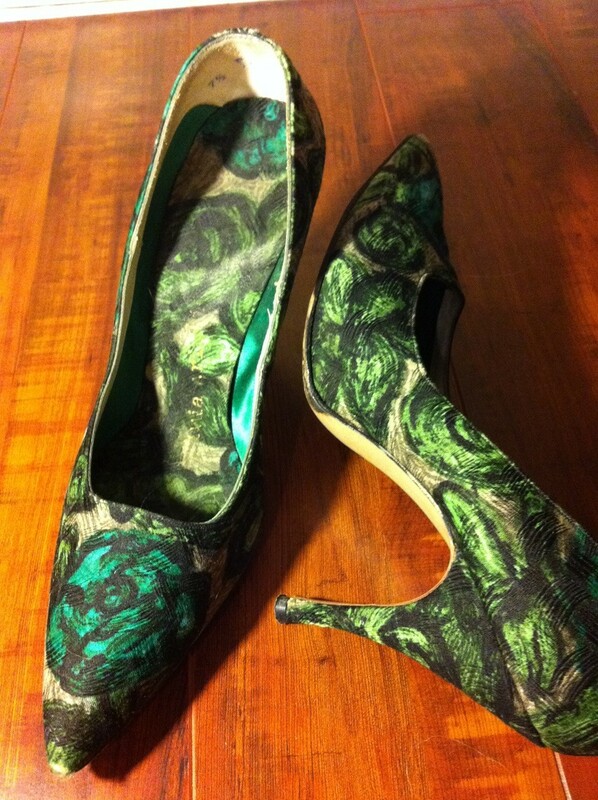 These d’Orsay peep-toes are from Calzaturifichi di Varese. Sadly, they now only make men’s shoes. Since 1899, they’ve been producing finely crafted shoes. “Today, just like a century ago, the craftsmen use the unique “Goodyear” work, which has always been a feather in the Verese firm’s cap: a seam joins the foot-strap, the vamp and a leather strip that runs around the shoe sole.” To a shoe lover, that’s some serious pillow-talk. I’m riled up! “Not even the smallest detail is neglected.” I know, right? Up close, I’m drawn to the slightly pinked edges. They’re like a peacock feather in this girl’s cap, yes indeedly do. 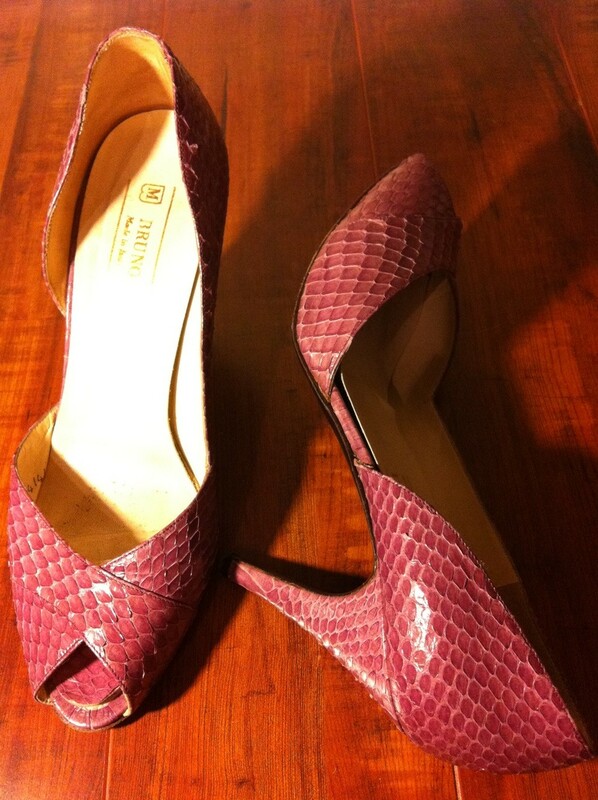 Oooh, Bruno Magli your tinted snake-skin milky-wine-colored pumps are something else. I hadn’t a coordinating color in my closet, but I wouldn’t pass these up. What is said in baseball holds true for rationalizing the purchase of shoes before an outfit: build it and they will come. You threw some great parties in New York City Magli family, you know. I thank you for the swagger these beauties give me. Last but not least are my “Interview” shoes. Serious in shape, the playful fabric makes them relevant for today. They were the only pop of color in my otherwise black ensemble. And. They. Got. Me. Noticed. While they’re in near perfect shape, most of the brand’s metallic stamp on the fabric insole has sadly worn away. **yl(r*)ia *ri is all the remains. Though I’ve worn them a handful of happy times, tonight I finally noticed the stamped inside which reads: Dec 27, 1961. What a find. As I’m wrapping this up, the BFF says good night. I hold out my pumps and show her my discovery. The BFF pokes her finger in my arm and says, “WOW! That’s how shoes are supposed to be made!” Hello? While she may never read this post, she gets what I’ve been saying. Hehe. shuzsociety.com ~ Much love to the Ladies of shuzsociety. Dorothea’s Closet Vintage ~ Boasts a handful of interesting designs, along with a size chart. 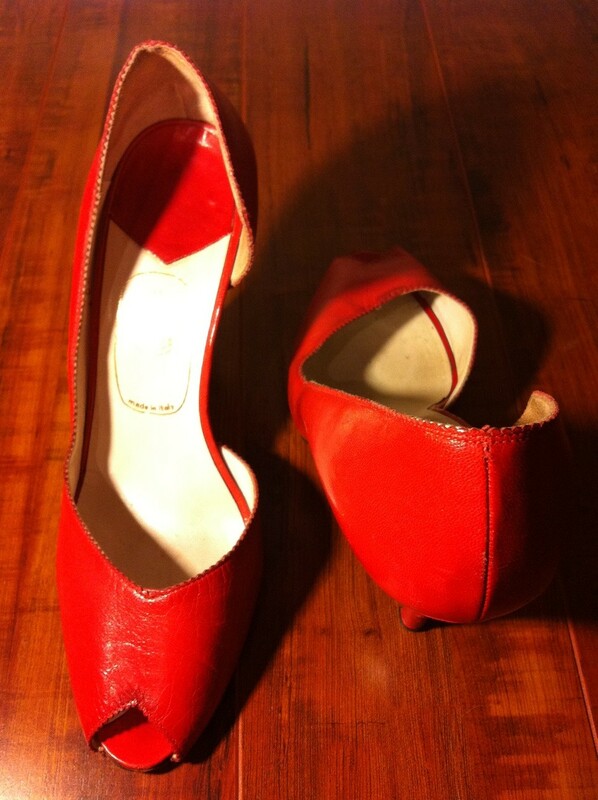 Posh Vintage ~ More than 60 pair of wicked vintage shoes: Yves Saint Laurent, Bruno Magli, Walter Steiger and more. Vintage Designer Clothing ~ While the site is terribly, they’ve compiled quite an impressive collection of designer shoes. Posted on October 26, 2010 July 1, 2012 by gadorawilderPosted in MusingsTagged Bruno Magli, d'Orsay, Hello Kitty, High-heeled footwear, shoes, vintage shoes. Previous Previous post: When My Time Comes… revisited. And the kitty kicks fit! Love love love! Oh GIRL. You do have a fabulous collection. And I was honored to borrow from your library a few times. A walk down your memory lane was fun – you sure have had some shoe adventures!